We didn't make any detailed plan for this journey. By the time we tried to book tickets; Railways was about to show Regret flag. Situation was not different with state run Karnataka or Kerala RTCs. So finally I opted for a private bus and reserved three tickets. Bus was supposed to start at 6.40 PM and reach Kottayam at 6.30 AM (next day). Bus was going really slow. Couple of hours after sunset we crossed KR-TN border; sometime before sunrise we crossed TN-KL border as well. One doesn’t have to see the place for identifying entry point to Kerala; sudden change from smooth to hamper bumper journey would give you the clue :) We left those portions and headed towards Thrissur. By morning we reached there and continued our journey towards Ernakulum. From Ernakulum onwards bus started hitting one traffic block after another. I was sitting in second last seat. When I woke up in the morning, we were very close to Ernakulum. I looked around - everyone was sleeping. Rakesh was sleeping like a baby on right side and Subeesh on the back seat. I slowly woke up and walk towards driver’s cabin. From there, view was interesting. Vehicles were moving fast in that four lane road, Kochi Metro's work was going on, people were waiting on the sheds for public buses. After travelling some more time in that road, we took a turn towards MC (Main Central) road. This 240 km long road was originally built by Raja Kesavadas (then Dewan of Travancore). MC road starts from Kesavadasapuram (in Thiruvananthapuram dist) and passes through Kilimanoor, Kottarakkara, Adoor, Pandalam, Chengannur, Tiruvalla, Changanassery, Kottayam, Ettumanoor, Kuravilangad, Koothattukulam, Muvattupuzha, Perumbavoor and finally rejoin NH 47 at Angamaly (in Ernakulum). Inauguration of a milk diary by ministers created another round of blocks. By 11.30am we finally landed at Kottayam Transport stand. Our driver was from Tamilnadu and spoke in Tamil only. I can understand Tamil to an extent, but can't speak beyond some words. Driver was very much unhappy with the situation. He started telling me about the problems one by one. Why government can't extend the road by atleast five feet each on both sides? Why so much strikes? Industries are not there beyond Cochin etc. Needless to say, I was not able to provide an answer for his questions as I have little command over Tamil. However, let me share some thoughts here. It’s very difficult to widen any roads in Kerala. Kerala is a very small state, lengthy but narrow. I think the best way to move goods across the state is not through roads but through ships and rails. Population density is very much high in Kerala, because of this authorities need to breakdown a lot of houses (Partially or fully) even to extend the road by 10 or 20 feet on each side. Acquiring land is next to impossible in Kerala, first of all that will turn out to be political hot potato, secondly, most of these house owners will go to court to get a stay. As far as industrialization is concerned; Kerala is a small state with very high population density. Government don't have the luxury to allocate hundreds of acres of land to industries. You may ask Singapore, Macau, Hong Kong, Taiwan are smaller, than why not Kerala? Let me remember you that, apart from having policy restrictions from Union Government, Keralities also carry a big burden of leftist ideological baggage, which generally opposes anything related to foreign investment. Forget about foreign investment, it is difficult for these ideologies to digest even private investments. You can see it’s after effects in Kochi international port, proposed port at Vizhinjam (Trivandrum), industrial areas, ubiquities love for strikes, frightening the industry by showing union highhandedness etc. Finally we reached Kottayam transport stand. After searching for another 15 minutes we got a room in Ananda Bhavan Hotel - triple bedroom for 650/day; 100 rupee/day for each extra person. Our plan was something like this – visit Kumarakom, Vembanadu Lake and Tannermukkam Bund on day one and attends the marriage on day two. Before going further let me tell you something about the places we are going to visit. For rest of the article, courtesy to Wikipedia's article on Kottayam. A view from Hotel, any one remember the movie Taken 2? Kottayam city - administrative capital of Kottayam district in Kerala – is a major centre of spice and commercial crops trade; host to many popular names in Kerala media industry - including but not limited to Malayala Manorama, Deepika and Mangalam. Before Travancore king Marthanda Varma annexed this area, it was an independent kingdom known as Thekkumkoor. Kottayam enjoys a special position in Kerala’s social movements - 1891's Malayali Memorial (for better representation of local people in the Travancore civil services), 1930's Abstention Movement (for representation of lower caste Hindus, Christians and Muslims in Travancore Legislature), 1924's Vaikom Satyagraha against un-touchability etc. Kottyam also have good foot print in Indian's inland water navigation system. Kottayam Port (Nattakom - near Kodimatha) is India's first multi-modal Inland Container Depot (ICD). Kerala State Water Transport Department (KSWTD) operates ferry services through the backwaters. These services are probably the most economic way to enjoy the beauty of Lake System. There are three jetties in Kottayam City - Town Jetty, Kodimatha Jetty and Kumarakom Jetty. KSWTD connects Kottayam with Alappuzha through the sides of “villages on either side of the canal, Large Lake Fields, Chithira church built on lake bank, 'R' Block where Holland scheme Agriculture is done, Lake Vembanadu, workes engaged in different jobs in lakes, Lamp post, Manorama church, Round Lake, Finishing point of Nehru Trophy Boat Race". For schedules, fare and other details, please visit - KSWTD. Kumarakom - well connected with Kottayam city - is a well known tourist destination (rise into fame after then premier A.B.Vajpayee spent his vacation there). 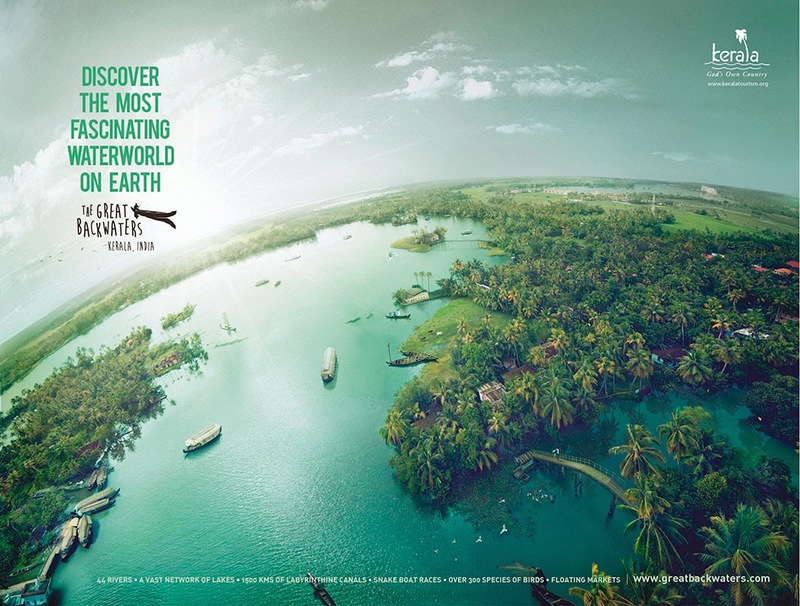 Main focus is on Vembanad Lake and luxury house boats. People visiting Kumarakom can also go to Kumarakom bird sanctuary and take rides in canoes operated by local folk. Two important things I need to mention, while talking about Kumarakom is, British Missionary Alfred George Baker and Arundhati Roy’s award winning book - 'The God of small things'. Baker’s Victorian model home was later converted to a hotel by Taj group (Taj Garden Retreat). Non-vegetarians can enjoy wide verity of fishes here, including but not limited to Karimeen (Pearl spot), shrimp (Poovalan chemeen) etc. Located some 8-10kms away from Kumarakom, bund (aka Thannermukkom Salt Water Barrier) is a popular sunset view point. Built in 1974 across Vembanad Lake, this bund connects Vechoor (Kottayam) with Thanneermukkom (Alappuzha) and split the lake into two - saltwater portion and freshwater area (fed by inland rivers). Main objective of this bund is to prevent tidal waves and salt water coming to Kuttanand low lands. Located below sea level, these areas are the lowest laying land in India itself. However, this bund created its own ecological problems. On monsoon season, authorities will open the shutters.